Chana masala is traditionally a chickpea curry that is normally quite dry, spicy and flavoured with citrus. 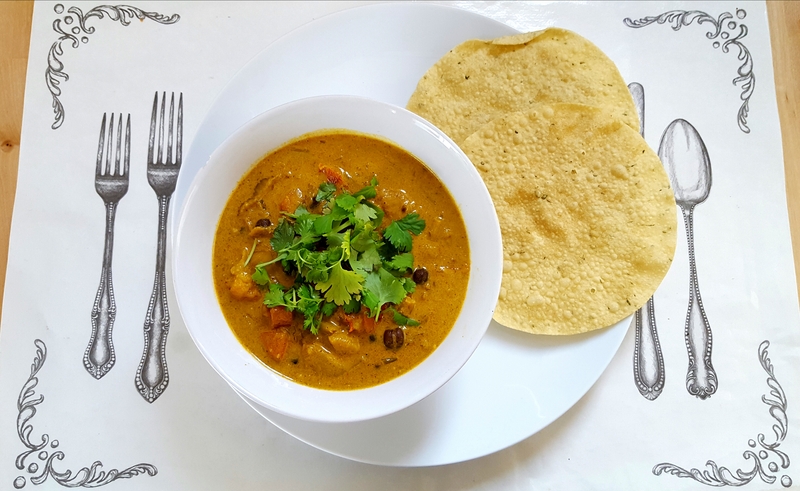 This variant of a Happy Pear recipe however, uses coconut milk as its base which creates a saucier curry, but with no loss of flavour. Although I made mine without meat, on reflection, the addition of beef to the mix and then cooking the dish in a slow cooker throughout the day would make for a really tasty carnivorous meal at dinnertime. This isn’t a particularly hot curry, but that’s entirely in your hands and depends on the amount of chilli you choose to add. A pot of natural yoghurt or crème fraîche on the dining table to help cool the palate is always welcomed by my partner when we eat curry. I tend to use brown chickpeas (also known as Desi or Kala Chana) in my cooking for two reasons. 1.) I can get four tins of them in the Indian section of my local supermarket for £1. And 2.) Although they have a brown coloured skin, they are still yellow inside and have a much deeper, nuttier flavour than their popular yellow brother. Chickpeas are a high FODMAP food in large quantities, particularly if you use dried ones, but if you buy the tinned variety and drain and rinse them well before using them in your recipe their FODMAP content is considerably lowered. As always though, use your own judgement as to what your own body and digestive system can tolerate. I served the curry with poppadums because I felt that with the amount of vegetables in the dish it was unnecessary to include bulky rice, but you could accompany the curry with pilau rice, naan breads, or chapatis. I know the ingredients list is long, but it’s worth it. And if you have leftovers they’re fantastic the next day because all of the flavours have been marinating together overnight making for a richer, more complex, curry. Prepare your ingredients as per the directions. Place all of your spices together in a small bowl. Pour the oil into a large pot and then fry the chilli and ginger for 5 mins on a medium heat, stirring regularly. Add the spice mix and some salt and cook for a couple of mins. Add in the tomatoes, carrots, green pepper, coconut milk and chickpeas and simmer for 15 mins (or longer on a low heat, if preferred, to encourage the flavours to marry). If you feel the curry is too thick add in some vegetable stock. Taste to see if it requires more salt (mine needed quite a bit). When you’re ready to serve the curry place it in bowls, scatter with fresh coriander and sprinkle with the lime juice.